Well it has been awhile since I actually did a post. So much has been going on in my professional and personal life. I kinda feel like my head is going to spin right off. So what has been up you may be wondering? Well professionally, everything! Book 2 Forbidden Embrace is out on Pre-release and launches on the 1st of September. I am also busy doing final prep for book 3 and my publisher has also requested a fourth book. So writing wise CRAZY! Now it has also be suggested that I start shopping the Embrace series for film options. I guess I gotta figure out what to do there...if you have any tips, please share (giggle). I have also been contacted by Chapters/Indigo in my city and they would like to schedule a book signing as soon as their order of Immortal Embrace hits the store. See all pretty exciting. Now Personally...I have had some bad news in the past few weeks. My dad who has Leukemia has also recently been diagnosed with Lymphoma and began his chemo treatments. We are very hopeful for recovery. Also this week my five year old son went through some testing and will be needing surgery. It is nothing major, but nonetheless it is surgery, and he had complications after his last surgery. Of course as a mother I worry, but am staying positive. Now that is enough doom and gloom. Good news is after a week of auditions, my oldest daughter has made it into her performing group again. This is exciting because it is a full scholarship program and I am so proud of her. Okay so Sunday August 28th is the final vote for best book. Immortal Embrace is going up against 2 other amazing books in the final show down. PLEASE, PLEASE remember to vote for TEAM EMBRACE....AKA......IMMORTAL EMBRACE. Just click on the BIG RED POSTER BUTTON to the right to vote, you can't miss it (giggle). This is it and I am so nervous, but thank you all for your support and encouragement . You have helped bring me to the finals, and I love you all.OH and remember there's still lots of prizes to win. Immortal Embrace is also on a goodreads poll for Fave YA vampire book, so make sure to check that our too. Here is the blog tour dates and links for THE EMBRACE EXPERIENCE. I really hope I got all the bloggers links correct but if I didn't, sorry bloggers and please send me a message with the correct link. I will also have all the links added under the link tab soon as well as dates posted on the calender. Thank you again to EXPERIENCE TOURS and all the great bloggers participating. I am so excited! Live To Read: Guest Post with Charlotte Blackwell: "Hello to all the Live to Readers, and thank you to Krystal for allowing me the chance to introduce myself. My name is Charlotte Blackw..."
Book & Movie Dimension: Live Chat: Interview with Promising YA Paranormal ...: " Ok, here we go! Me: Glad to have you here today at Book & Movie Dimension. You have some books available. Let's talk about what's in..."
Voting starts today! Don't forget to go to the button on the right and Vote for Team Embrace and Team Crossroads. Voting is only open on Sunday August 14th and there are tons of prizes to be won. Well a few big announcements today. So this post will be on the main blog and under news. So are you ready for it? Okay Forbidden Embrace has been pre-released today on e-book through smashwords. That's right you can get it now and continue on the Embraced journey. Now the other big news is I am going on blog tour with the Experience. So keep your eyes out for me, there will be interviews, giveaways and so much more. For other authors, you can get your own experience tour by clicking on the Embrace Experience button to the right, it will take you right there. I would like to give a huge shout out to Jen from A Book and A Latte for introducing me to the experience. Thanks Jen. SeeitORreadit: Immortal Embrace by Charlotte Blackwell: "Sophia Pierce has suffered since her brother left, and is unsure if she will ever get over it. That is until her family decided to move to W..."
Forbidden Embrace book 2 of the Embrace Series and the much anticipated sequel to Immortal Embrace is less than a month away. Today I will share a little about the exciting sequel. Danika and Caspian both learn what trouble is when they get involved with the wrong crowd, the Cerberus. It is through the rogue vampires that Caspian and Danika learn where they belong and what really matters once they realize who they really are. I need to give Nathanial more details about me, my existence and what is come. “This place is wonderful!” He gives me one of those crocked half smiles and runs his hand through his truffle brown hair in the way that melts me. “Well I’ll begin with a little vampire history, what do you know about vampires? Actually never mind, I’ll just explain if that is ok?” I mutter, nervously tapping my foot. “Relax you don’t need to be nervous, I’m not going to judge you, just explain and I will listen, saving all questions for after your explanation.” He soothes me within seconds. “Fair enough, but I do want you to stop me if it becomes too much for you to handle.” I insist. “From the beginning there has been a myth that the first of our kind was Cain, the son of Adam and the first murderer. Cain murdered his brother Abel because God preferred the gifts Abel gave to him over Cain’s gifts. It was out of pure jealousy Cain killed his brother. God could not believe Cain had done such a thing and as his punishment Cain was cursed by God and transformed in to a vampire, forced to walk the earth alone night after night for all eternity. Cain was therefore exiled from the people and forced to stalk the civilization. He feared the sun because it burned him and it was extremely painful. So he would come out at night to hunt the mortals, he was ravenous for blood.” I begin to pace a little. “Sophia, you’re rambling.” Nathanial chuckles. I pause for a moment to gauge his reaction, which is nothing except complete and intense interest. Kindle Author: Kindle Author Interview: Charlotte Blackwell: "Charlotte Blackwell, author of Immortal Embrace , discusses her book, her journey as a writer, and self-publishing on Kindle. DAVID WISEHA..."
Kindle Author: Kindle Author Interview: Mary Ting: "Mary Ting, author of Crossroads , discusses her book, her journey as a writer, and self-publishing on Kindle. DAVID WISEHART: What can you..."
Sweet Sample, I decided to go with the football game from Immortal Embrace, I hope you all enjoy and don't forget Sunday is VOTING day for Immortal Embrace, just follow the big, red poster/button to the right. It will take you right to the sight for voting. Thanks for your support, can't wait to read all your comments. At the game, we score some great seats in the first few rows at centerfield, right behind the home team bench. We all enjoy football; it is a great contact sport. The excitement of attending my first high school game is building up in me, or maybe it’s just the excitement of seeing Nathanial again. We join the crowd as they jump to their feet and cheer while the team runs on the field, ripping through a big paper banner the cheerleaders have made for them with markers and poster paints. The entire team is hungry for the first win of the season, and the excited and screaming crowd is pumping the energy they need right their way. Nathanial leads the team to centerfield, and once again, he astounds me. Ignoring her later statement I look up at him, and then, out of nowhere, he stops and drops his helmet right in front of me. His mouth is hanging open like a Saint Bernard staring at a steak. I don’t know how else to react so I just smile and wave, as my heart nearly leaps out of my chest. I can hear him breathing the words ever so softly above the crowd’s cheers. Keeping him at a distance is going to be harder than I ever expected. I am experiencing feelings I have never had before. I feel giddy about Nathanial’s reaction to me tonight and excited to watch him do what he is so passionate about, what he loves. I have such a feeling of confidence and pride, and it seems Wenham is giving me a sense of security that I haven’t felt in decades. I even feel like it may be okay to let Nathanial in, at least a little. That way, I can keep an eye on him and make sure he remains safe. I am overly protective of him, even though I cannot explain it. Can it be true? Could he be the one? We only met last month. Is that what they mean about love at first sight? About finding your soul mate? No, it couldn’t be. I do not want him to be a part of this. I want nothing more for him than a long and happy life, free from danger, secrets, and drama. Why does he confuse me so much? I have never experienced such conflict within myself before. Once again, Alexander shares my thoughts with the others. “How can he want this? He does not even know what this is!” I reply. “I see it, too, Sophia. Your souls match perfectly, like no match I have ever seen before” Matilda adds. I sigh and turn to watch the game, but in spite of all the action on the field, the sidelines and in the stands, I mostly watch Nathanial. I can’t help wondering if my family could be right, if Nathanial really is my soul mate. Are we meant to be together? I just can’t understand how he could ever want this. I would not wish this kind of existence on anyone–and that’s all it is...an existence and not any kind of life. “The game is going great,” Isaac observes. Everyone is excited as the halftime whistle blows. The halftime show begins, and in the backdrop behind the band and the cheerleaders, the bright orange numbers on the scoreboard shows that our team is up by fourteen points. “Wow! Those cheerleaders are really good,” Alexander says with a sadistic smile. “Are you kidding me?” Matilda smacks him upside the head. In less than an hour, the game ends, and our team is victorious by thirty points. This is just what Wenham High needs for its morale. “I can’t believe Nathanial made five touchdowns! He was on fire tonight!” I exclaim, bursting with unbridled excitement and pride. The entire crowd starts chanting his name, “Nate! Nate! Nate is great!” as the other players parade him around on their shoulders. The local newspapers are snapping pictures and preparing for interviews. I am so happy for him and the team. He looks even better than he usually does, if that is even possible. Nathanial is so happy and excited, and his eyes are sparkling with joy. I never imagined they could shine so brightly, but as he looks at me, his eyes light up like bright blue shooting stars dancing across the sky. I stand next to my family as we all watch this magnificent man who is hailed a hero by his teammates and the onlookers. But I can’t let him in, and this is going to be one of the hardest things I have ever faced. “And we will all be here with you, sis.” Alexander wraps his arm around my shoulder. The team parades in front of us. Nathanial pats the shoulders of his teammates to put him down. I watch as he pushes his way through the crowd and runs up to me. He wraps his arms around my waist and swings me around. I melt into his strong sweaty arms. When he finally places my feet ever so gently back on the ground he kisses my forehead and with his index finger lifts my chin up ever so slightly so I am looking right at him, right into him, and he into me. “You are my lucky charm, you know. Now I can never let you go.” He smiles. “I doubt that,” I reply. “I wish I could but I have plans with my family tonight, and they’re kinda important. I’m so sorry, Nathanial. I wish I could help celebrate your victory.” I pout, knowing once again I am not being fully honest. We need to be clear headed for tomorrow, so I do not want to cloud myself with Nathanial. “No worries gorgeous. It won’t be the same without you there, but maybe we can catch up on Monday,” he suggests. “Aw, it was nothing. I was just showing off for a pretty girl.” We both chuckle, and he gives me another hug and runs off to the dressing room to take of his pads. This is it. Every time I see him, I let him in a little more. I can’t fight it much longer. 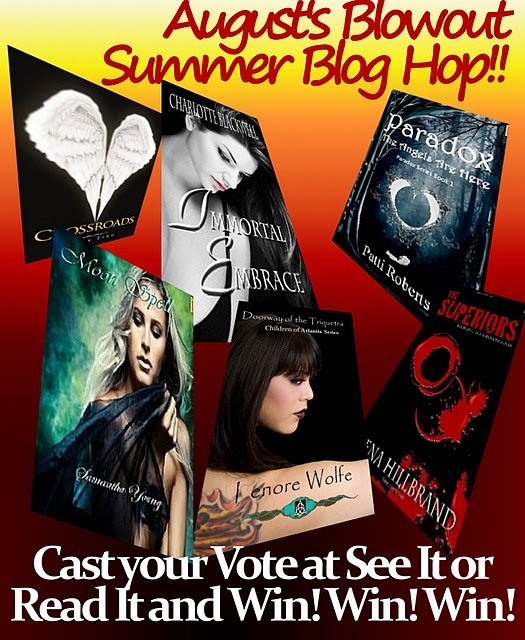 On August 7th the first round of voting begin's for best book. Don't forget to cast you vote for TEAM EMBRACE. Then enter for your chance to win! Tons of prize to be had and many chances to enter. Today marks the first day of the MEGA blog hop I am in. So what does this mean well easy PUMP MY BOOK! So for those of you that are interested I have an except from Immortal Embrace just 2 posts below that you can check out. The go on over to the See It Or Read it blog (link button in the side bar) and check out the great contests going on this week. All week I will be coming up with other ways to get Immortal Embrace out there and the on the 7th you the readers go to the polls and vote for Team Embrace. Team Embrace consists of myself , my novel Immortal Embrace and the wonderful Blogger, writer, radio show host and friend Joann from The Eclectic Artist`s Cave. Don`t for get to check out her blog (button also in the side bar) and her radio show Monday through Fridays at 12pm EST on Fate Radio . Now is there anything you want to know from me? I am opening my blog up to you the readers this week. Ask me anything in the comments below and I will answer all (PG Rated) questions in my blog post tomorrow. 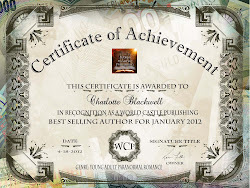 Anything you want to know about me, publishing, writing, the floor is yours. So lets see the comments come in and don't forget to VOTE TEAM EMBRACE on August 7, voting takes place at the see it or read it blog every week till the end of August. SeeitORreadit: Week 1 (Aug 1st- Aug 7th): "Hello Everyone and Welcome to the Start of August's Blowout Summer Blog Hop! This is the first week and our representatives and author's a..."